Ideas | What Makes a Revolution? Current debates over whether the world is experiencing a revolutionary wave assume a past history of such waves yet rarely examine in any depth the historical record. In their first essay of a three-part series on the subject, Laurence Cox and Alf Gunvald Nilsen look at revolutionary waves in history. Over the last few years many pundits, as well as occasional activists and researchers, have asked whether recent social movements around the world constitute a revolutionary wave (or similar phrases). Part of the difficulty with these arguments has been the lack of any real factual context, so that a general hand-waving towards 1848 or 1989 has been enough to go on and say whatever the author wants to say. The logic of the argument, though, is a historical one: that there have been revolutionary waves in the past, whether or not they are happening now. If so, it is worth looking at past waves to consider what separates them from other social movement waves; what might define them; and what else we can say about them (for example around timing our outcomes). This series of articles tries to do this historical legwork (this article); asks how we can understand such waves from a Marxist point of view (the second installment) and what this means for how we understand the present and what movements should do (the third and concluding piece). Generally speaking, the argument is confused in three ways. One is in terms of what present-day events are considered and how far back we go: the “Arab Spring”, the Latin American “pink tide”, European anti-austerity movements, the Occupy movement, the anti-capitalist “movement of movements”, various kinds of “anti-imperialist resistance”, or single-country movements? The answer to this question is usually asserted rather than justified – let alone substantiated with any sort of historical comparison. A second confusion is around the concept of a ‘wave’. Many commentators have very little real idea of what historical revolutionary waves looked like, and so dismiss the possibility that such a thing is going on by observing that different actors are involved, that there are different and not always compatible demands, that levels of direct communication and coordination vary, and so on. The implicit model of what a wave looks like is drawn not so much from history as from advertising campaigns and astroturfing, where a single coordinating centre distributes logos and slogans globally. Even the relatively coordinated experiences of (say) the European revolutions of 1916 – 23 or anti-fascist and anti-imperialist resistance in Europe and Asia in the 1940s do not meet this kind of standard, let alone less centralised events such as the Atlantic revolutions of the 18th century or the events of 1989. A third confusion lies in the concept of revolution – which is made no easier by thinking about events in process. “Revolutionary-ness”, after all, can be understood in terms of actual outcomes – do regimes fall and do societies remake states? – but we are not yet at the end of events in many cases, and experience shows that what seems like a stable settlement may readily crumble in a second round. Revolutionary-ness can also be assessed in terms of actors’ ideas, intentions and interests – but again experience shows both that people can become radicalised in the course of movements and revolutions and that revolutionary processes often expand to include groups which are not among those mobilised at the start*. Here too, we are often dealing with clichés rather than any very strong historical grounding. All of this leads to some very circular arguments, in which the boundaries of the putative present wave, its wave-ness and its revolutionary-ness (or otherwise), are determined on the basis of unexamined assumptions. If we can clarify, at least to some degree, what can usefully be said about past revolutionary waves, we can perhaps arrive at a concept that is independent enough of the present that we can ask a genuinely open question about whether there is now a revolutionary wave in process – and think about what that might mean for activists and movements. Past revolutionary waves: what can we say? There are, to put it mildly, divergent views on which revolutionary waves can be identified in the historical record. Wikipedia proposes no fewer than 15 such waves since the late 18th century, including one in 1830 that combined the French July Revolution and the Belgian Revolution; the US Civil Rights Movement; and one for 1979 including Nicaragua, Iran and the invasions of Cambodia (by Vietnam) and Afghanistan. They do, however, proceed to add 1789 and 1917 as key dates. Their main criterion, as with Katsiaficas, is not simply events but the transformation of popular agency: in particular, turning points for antisystemic movements’ relationship to the state. How can we make sense of all of this? We can agree with most of the authors mentioned that what counts is revolutionary situations, however defined, rather than revolutionary outcomes. 1848 and 1968 are classic examples of this: few if any of these movements ever stood a chance of winning (something which can also be said of many situations in other waves), but revolutionary situations nonetheless existed in a wide range of contexts at these two points in time. We can also drop the apparent need to include events in a revolutionary wave as though it makes them more significant. The Paris Commune, for example, was a purely French (or, if one insists, Franco-Prussian) event: this does not make it any the less significant. There is no need to multiply waves indefinitely in order to underline individual events: so, for example, the events of 1979 do not constitute a “wave”: there are two invasions and two revolutions (Nicaragua and Iran), with no obvious links. We also need some kind of scale. At one end, the events associated with the Greek, Cretan and Moldavian wars of independence – or with the 1830 revolutions in France and Belgium – are interlinked in immediate and local ways. We need some kind of marker of “global-ness”, going beyond a single state or intertwined states/regions. But it is equally clear from any of the lists discussed that few if any revolutionary waves have been fully global. Even the most extensive account of contemporary struggles would have to acknowledge that there are significant areas untouched by anything that could remotely be described as revolutionary; the same is true for past waves. A useful scale is to identify such waves as including one or more regions of the world-economy, a definition that allows us to avoid getting trapped in definitional circles about the extent of such waves. If (for the sake of argument) we agree that both western Europe and north America were affected by 1968, its identification as a revolutionary wave does not stand or fall on our assessment of whether events in Mexico, Czechoslovakia or Japan (or, for that matter, the slightly later fall of fascism in Iberia and Greece) were also revolutionary, or part of wider waves in those regions – although these questions remain important for other purposes. What is fundamentally being said is that the state form in at least one region of the world-economy was seriously shaken – successfully or otherwise – by movements from below. What else can we say? Colin Barker points out that not all waves of contention (or social movement waves) are revolutionary ones. He quotes figures of 2.2% and 1.8% of the population involved in early 1980s movements in West Germany and the Netherlands, by comparison with Polish Solidarity (p. 19). The latter had perhaps 10 million members in 1981, around 27% of the total population – comparable with participation in the 1968 general strike in France (20% of the population, two orders of magnitude larger than the 0.2% of the French population involved in movements in the early 1980s). These kinds of figures seem intuitively right, especially once we remember that these are proportions of the total (not just adult or working) population, and that many adults who were not able to join a union or go on strike nevertheless either supported these specific activities or engaged in others: we are talking about at least a third of the society engaging in a direct confrontation with the authorities. Clearly some qualitative assessment is also needed. In 1960, for example, blacks made up only 11% of the US population; later in the decade, Northern Irish Catholics made up perhaps 1% of the population of the UK; and the indigenous populations involved in (say) Mexico, Chile or Canada are of comparable sizes: where a social order is also a racial or ethnic order, it can be enough for a strategic but oppressed minority to act with some cohesion for everything to change. 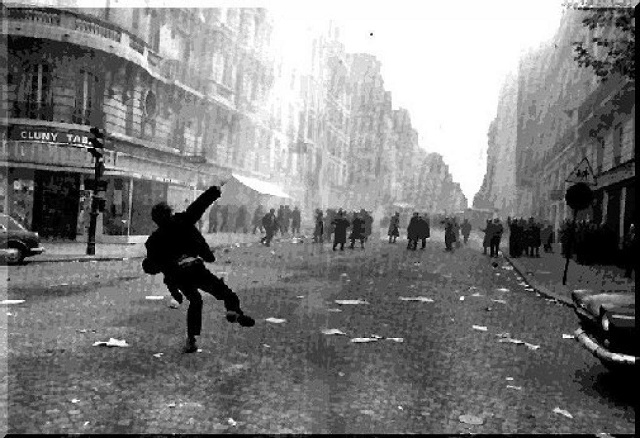 More broadly, although we should not see revolutions and social movements as completely distinct, not all movements develop into revolutionary situations. So what revolutionary waves should we include? The Atlantic Revolutions of the late 18th century (notably the American and French revolutions, the Haitian revolution, the Batavian revolution of 1795 and the 1798 uprising in Ireland). The early 19th century Latin American wars of independence – sometimes seen as a second wave of the Atlantic Revolutions. The failed liberal revolutions of the early 1820s in Spain, Portugal, Naples and Russia, together with the Greek wars of independence. The European revolutions of 1848. The democratic revolutions of the early 20th century (c. 1905-10), including the Mexican Revolution, the 1905 revolution in Russia, the revolution of the Young Turks, the establishment of the Portuguese republic, the constitutional revolution in Persia and the failed Argentinian revolution of 1905. The revolutionary period in Europe from 1916 – 1924, which saw the establishment of the Irish Free State, Weimar Germany and the USSR, the collapse of three empires and a wave of revolutionary situations among many other events. The anti-fascist resistance in Europe from c. 1943, and the Asian cycle which saw anti-colonial movements, resistance to Japanese occupation and forced decolonisation, handing power to a mixture of nationalist and socialist/communist movements. Other post-war anti-imperial struggles are highly complex and contested, but at least some anti-colonial struggles in Africa from the 1950s up to the end of apartheid, some aspects of post-war Arab nationalism and some guerilla struggles in Latin America might be understood in terms of revolutionary waves. The revolutions of 1989, including events in Soviet Central Asia, the failed Chinese revolution of 1989 and events in Soviet client states elsewhere. “Colour revolutions” in early 21st century Ukraine, Georgia and Kyrgyzstan are sometimes linked to this. A few things become clear from this. Firstly, revolutionary waves can last a long time; alternatively, (as with the Atlantic Revolutions and Latin American wars of independence, the events of 1989 and “colour revolutions”) two-wave sequences are not unusual. It is not uncommon to link (for example) 1905 and 1917 in Russia, French revolutions from 1789 to 1871 or the “European civil war” from 1917 – 1945 as part of a wider sequence of struggles; the time boundaries of revolutionary waves are not clear-cut but they can easily go beyond contemporary, media-driven attention spans. Secondly, not all revolutionary waves have mostly revolutionary outcomes: it is really only where global powers have been defeated (as in the Latin American wars of independence, the aftermath of WWII or in 1989) that most subaltern challengers are successful. More commonly, there are only a few successes. Thirdly, ideological homogeneity is not a given: it marks some liberal-democratic-nationalist waves, but for others (1916-24 in Europe, post-WWII Asia) it is anything but the rule. The idea that because movements do not have a homogeneous base, disagree about strategy and tactics, contain various political tendencies and work differently in different countries, they are therefore “not a movement” depends on a caricatured notion of movement. The making of EP Thompson’s English working class was a complex and contested achievement of bringing together hugely diverse groups within a very loose cultural and political identity; as Barker points out, movements are necessarily fields of conflict as well as collaboration; while the historiography of 1968, the Resistance or even the early Comintern shows just how diverse these movement waves – flattened in memory and representation – actually were. Communication and collaboration, a shared sense of “we” and “they”, compatible strategies and analyses are all achievements of shared struggle: they do not precede it but are part and parcel of how people remake themselves in movement, as they articulate their local rationalities to one another, combine their militant particularisms into campaigns and articulate movement projects. Of course, the fragile constructions of solidarity, cooperation and debate can become irretrievably ruptured, just as opposing forces may be capable of rallying and deploying effective resistance or reasserting their hegemony: hence homogeneity can no more be a starting-point for analysis than revolutionary success. Finally, such waves (like revolutions themselves) are common enough that we should not see them as requiring special explanations. The purpose of special explanations is usually either to legitimate new states (founded by ‘unique’ events) or to dismiss challenges to capitalist stability (caused by ‘odd’ circumstances). Revolutionary situations happen. Not all the time – “normality” is defined precisely by a situation in which “business as usual” dominates – but they do happen, and, often enough, they happen in waves. Whole regions of the world-economy succumb to such waves with a certain historical frequency: the period between the events of 1848 and the democratic revolutions, from 1905 onwards, is the longest quiet period in terms of waves, and often they appear with a frequency closer to 20 years. Put another way, global power arrangements do not last more than a few decades without being significantly disrupted in at least one region. Of course, this also means that any individual region may go rather longer without experiencing a revolutionary wave – and as yet we have said nothing about the implications for capitalism, or a particular mode of accumulation, as a whole. So a working definition of revolutionary waves is that they are a special kind of social movement wave, one present across much of at least one region of the capitalist world-economy (often with outliers elsewhere) and by revolutionary situations, though not always outcomes. Over the past quarter-millennium of capitalist history, such waves have occurred every few decades, often spanning considerable periods of time (or there may be multiple, linked waves). Neither revolutionary outcomes nor ideological homogeneity work as elements of a definition. This is what the recent historical record can tell us. The second article in this series asks how we can explain this experience, while the third installment returns to the question of whether we are now in a revolutionary wave, and what this means for movements. 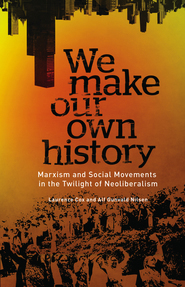 Laurence Cox and Alf Gunvald Nilsen are co-authors of We Make Our Own History: Marxism and Social Movements in the Twilight of Neoliberalism. *Matters are confused further by the attempts of both local actors and western powers and media to present particular events as either genuine popular upsurges against a regime (Maidan, Venezuela) or no such thing (Crimea, India) – and the multiple filters which mean that most “serious journalism” on these matters is produced by journalists who specialise in conventional politics, have just arrived on the spot, and in many cases do not speak the local language. Laurence Cox is an activist and social movements researcher based in Ireland, co-edits the social movements journal Interfaceand co-directs an MA in activism at the National University of Ireland Maynooth. Alf Gunvald Nilsen is associate professor of sociology at the University of Bergen. His research focuses on social movements in the global South, with a specific focus on India. Alf is the author of Dispossession and Resistance in India: The River and the Rage and the co-editor of Social Movements in the Global South: Dispossession, Development and Resistance and Marxism and Social Movements. Just to say that this week (1st – 7th Oct) all Pluto books (not just “We Make Our Own History”) are on sale at 40% discount: click on http://bit.ly/plutob2u to activate the discount. This book works out at £10.20. The second essay in this series is now online at https://ceasefiremagazine.co.uk/making-sense-revolutionary-waves/.